If you're anything like us, you have a lot of gear. Keep it all organized with the Beach & Boat Fish Skin Tote. 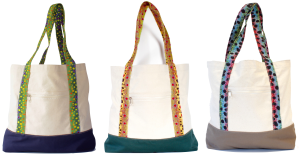 The oversized 100% canvas construction, zippered outside pocket, and over- the-shoulder accent fish skin handles make this tote the perfect carry all for any adventure. 100% canvas; Oversized construction: 20"W x 15"H x 12"D; Zippered outside pocket.